Ha! I thought that would get your attention. 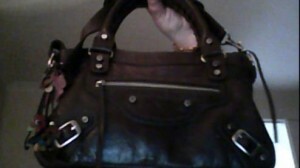 Sadly this beautiful Balenciaga handbag (pictured) is a one-off. It’s a fabulous find by Michele Smith: a Miss Thrifty reader and bargainista extraordinaire, who posted about her lucky discovery on the Miss Thrifty Facebook page. Michele, who paid just £7.99 for this Balenciaga bag after finding it in a thrift shop, reports that it usually sells for £1,500. Michele says that it isn’t the first good handbag she has found in thrift shops. She hasn’t told me where these extraordinary thrift shops are; perhaps that is wise, because I would be over there like a shot. So what gems have you found recently? Leave a comment or post a picture to the Facebook page – we’d love to see them!